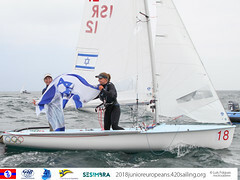 The fifth day of the 470 Junior European Championship, and it was a day when the winners thought they were lucky while the ones who fared less well were blaming it on themselves. After a long wait for the wind to settle, the 92-boat fleet was sent afloat shortly after 1400 hours as the wind finally settled - or appeared to - in a north-easterly direction. Having only completed one race on the previous day, the Silver and Bronze divisions were the first to set off, followed by the contenders for the overall championship in Gold. Almost all the leading lights struggled to string the wind shifts together and put a good score on the board. Ferdinand GERZ and Tobias BOLDUAN (GER) couldn’t quite believe they were still in 2nd place after finishing 12th today, although their demeanour suggested they’d done worse. “We didn’t finish really well today. Upwind we were always on the wrong shift, always sailing in the headed breeze, then we spent quite a long time in bad wind. We went to the right-hand side, and the left side was best. So we were almost last at the first mark, and we took a risk and it didn’t work, so we finished dead last. 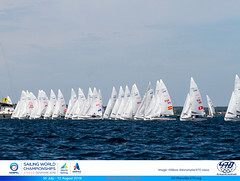 It was more than 200m to the top 20 boats so we had to do something. But we have chances tomorrow, we’re still in 2nd, and there’s much to play for.” The Germans’ slip has given the Championship leaders even more breathing room at the top of the scoreboard. The French team, Sofian BOUVET and Jeremie MION, thought they’d had a bad day finishing in 10th, and yet they find themselves in a stronger position overall than they were before today’s challenging race. It was hard to find a team in the boat park today who thought they’d done well. The Greeks who won today’s race were being modest about their victory, but perhaps that’s because they were within earshot of their compatriots who had come 21st, dropping them from 3rd to 4th overall. As for today’s winners, Makarios NEOCLARAS and Orestis TSANGK, their first place moves them into 7th overall and still within striking distance of the podium. If the 13-point lead for the French in the men’s division looks healthy, the 21-point lead for the top women’s team is even more so. Viktoria JURCZOK and Josephine BACH (GER) scored a 11th place in today’s race - nothing special but nothing disastrous. The only women who closed the gap at all were the Greeks Maria VOULGARAKI and Danai PASCHOU whose 5th place finish puts them into silver medal position just one point in front of the defending European Champions from Germany. 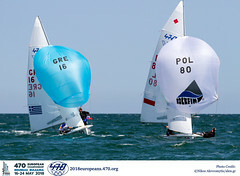 In the Silver division, Tim ELSNER and Lasse Gulzow (GER) sailed an excellent race to take the winner’s gun, and this moves the Germans up to 10th in the fleet. A 7th place for Paolo CATTANEO and Vittorio ZAOLI keeps the Italians in 1st overall, but only by the skin of their teeth as the Hungarians Botond SZIGETHI and Kristof JOO closed to just a point behind them. The home teams are also doing very well in the Bronze division, with women’s team Réka VIGH and Kinga SZABÓ moving into the lead ahead of their male compatriots Tamás VIGH and Máté KOVÁCS. These two teams can’t allow national pride or sibling rivalry to dominate their tactics, however, as there are a number of teams breathing down their necks in a division that remains the most open and undecided of the three fleets. Tomorrow the race committee will hope to be able to complete two races for the Gold and three races for Bronze and Silver divisions, before the climax of the Medal Race on Sunday.